Oclipse® was named the #1 best sunscreen by the online beauty authority. Not just because it has broad spectrum UVA/UVB protection; not just because it multi-tasks as a makeup primer; and not just because it’s tinted (bye bye white and pasty sunscreen!). The best part: it’s something you’ll want to wear every day. Have you ever said that about a sunscreen? It’s the smart sunscreen, because it features natural melanin. If you’re going to do just one nice thing for your skin this is it. The skin faces many challenges on a daily basis, from the sun’s harmful UV rays, inflammation, weather conditions, diet and of course the ageing process. Like our bodies, it’s vital to feed and nourish skin to maintain skin health for a youthful and clear complexion. Advances in dermatological science in recent years have revealed the benefits of vitamins, antioxidants and other nutrients when applied to skin and the ZO Medical and ZO Skin Health ranges from the leading expert in skin rejuvenation, Dr Zein Obagi, have been carefully formulated using this knowledge and expertise. At Juvea Aesthetics, we pride ourselves in using only the most effective advanced skincare ranges for our clients, which is why we are stockists of the ZO Medical and ZO Skin Health ranges and always at the forefront of new additions to the line. 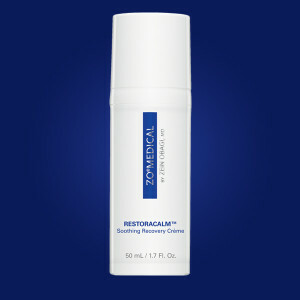 One of the more recent additions to the ZO range, Restoracalm Soothing Recovery Cream was created especially to provide relief to and soothe compromised skin whilst using aggressive treatments from the ZO Medical range such as Brightenex or Retamax – great for our clients who need that extra care for their peeling skin. 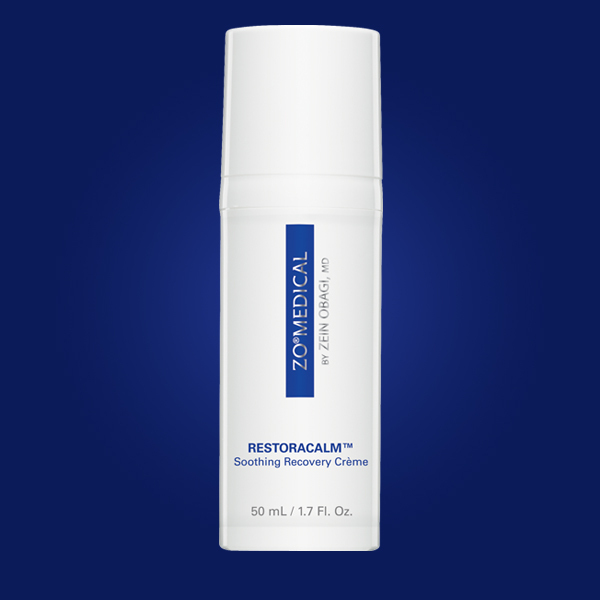 Suitable for all skin types, Restoracalm helps reduce redness, calm any skin irritation and also stimulate restoration for your natural skin barrier. This velvety and nourishing cream brings immediate comfort and hydration when your skin is feeling sensitive or weak. The specially created blend of Buddleja plant stem cell technology and beta glucan (known to soothe the skin) provides quick relief, reducing the appearance of redness or flakiness. Silk serecin protein biotechnology supports the skin’s own recovery process as well as protecting from sun damage therefore you will notice an overall improvement in the skin! Easy to apply in just one or two pumps, Restoracalm Soothing Recovery Cream does not interfere or diminish the results of any skin treatment you may be undertaking. ZO Medical and ZO Skin Health products are exclusively available at leading UK physician practices such as Juvea Aesthetics in London.